Water is always flowing. It runs down sidewalks after a rainstorm and may trickle into a brook near your home. 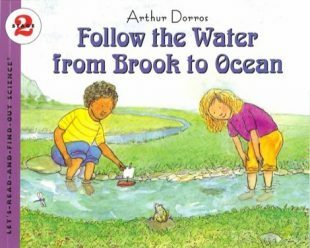 From raindrops to a sea-follow water’s journey as it flows from a brook, to a stream, to a river, and finally to the ocean. Find out how water shapes the earth, how people use water, why it is important to keep our water clean, and how water travels. From my early puddle-splashings and accidental flip into an icy pond at age three when I bobbed in the emerald water with oak leaves (see “Author’s note” for A TREE IS GROWING for more about that), I’ve been interested in water. After a rainstorm, I would float leaves in the rushing water along the sidewalk. I’d drop twigs into streams and watch them sweep away with the current until they were carried out of sight around a bend. Later I built small boats and rafts of sticks, which also swept away. I imagined the small crafts’ travels. I took boat trips when I was much older and floated by forests, fields, islands and towns. I swam and snorkeled, observing the incredible world in the water. But it wasn’t until I started the research for FOLLOW THE WATER… that I thought so much again about water’s journey. From where I live, in the Pacific Northwest-famous for water (we tell people there’s lots of water here, but there’s not nearly so much as you might think), I can see snow-capped mountains sparkling. Every winter there is talk about how much snow is accumulating. The water that comes in spring or summer from the melting snow is important for all of the people below. That water is needed to fill reservoirs, for drinking, for generating electricity, for the salmon and other fish that swim in the waterways. When I first moved to the Northwest I was amazed when I saw salmon with their bright green heads and red bodies ready for spawning, splashing their way up a creek so shallow that their backs stuck out of the water. They didn’t need much, but they needed water, clean water that left gravel bottoms clear for them to lay the eggs that might hatch and grow to become the next generation of salmon. I’ve watched eagles wait, bears wait, for the return of the salmon each year on the waterways. There’s lots of talk about water-for salmon, for people, for all that grows and changes along water’s paths. Whether it’s a drop or an ocean, water still catches my interest.